1. What do you watch or read during me-time? Mostly blogs or Youtube videos, seriously all my evenings are spent mostly on the laptop catching up on blog posts or videos, especially in December when a lot of people post/vlog everyday and there is so much content to get through. 2. What do you wear during me-time? The comfiest pyjamas I can get my hands on is pretty much what I wear. Now that it gets dark super early I automatically use it as an excuse to jump into my pyjamas as soon as possible. 3. 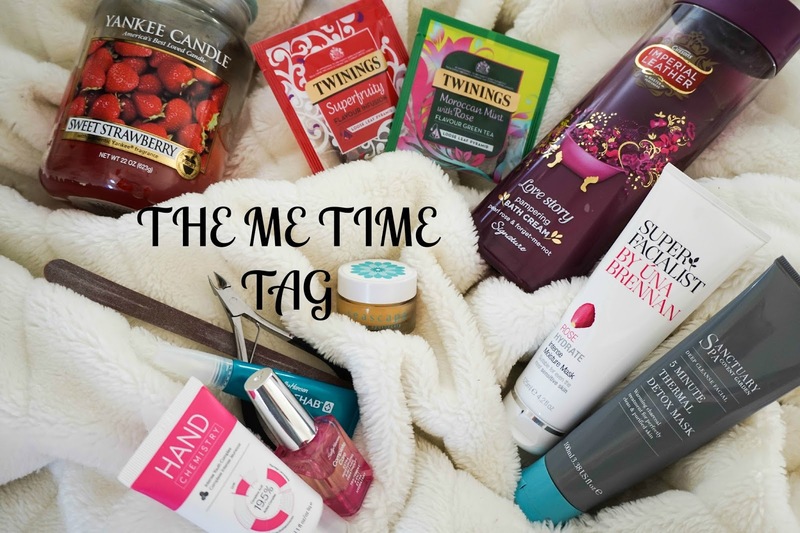 What are your me-time beauty products? I love anything that I can use to pamper or treat myself, so for skincare I love using masks and for baths I love using bath soaks/bubbles. 4. Current favourite nail polish? I love anything burgundy but what I really love doing during me time is giving myself a manicure which is always badly needed as I leave it until I literally look like a scruff. My hands can get quite dry this time of year especially around my cuticles so trying to keep them moisturised and in shape is a struggle. 5. What do you eat or drink during me-time? I tend to just make myself a nice cup of tea, I try to stick to the herbal ones in the evening as they are caffeine free or else I have trouble sleeping. Eating is usually a naughty snack let's say some good ol' chocolate. 6. Current favourite candle? At the moment I am still using my summer candles which are coming to an end (I am actually so excited about this as I can't wait to use the glass jars probably for storing makeup or something to that effect). I am currently trying to find a store nearby that sell Yankee candles so I can pick up a wintery scent. 7. Do you ever have outdoor me-time? I'm not even going to attempt lying, nope I don't. I am super lazy and why would I want to be out on my own in the evenings when it's dark and cold, no thank you. 8. Would you ever go see a movie alone? No I wouldn't, I hate even going to eat somewhere on my own. I guess for me it's all about the experience you share with someone going to see a movie rather then the actual movie itself. 9. Favourite online shop? I can't say I shop online very often but in the last few weeks The Body Shop has seen a lot of my credit card since I have bought a few things for myself and a lot of presents for others. I love how fast and efficient the delivery is and you really can't beat some of the amazing deals they have on at the moment. 10. Anything to add? What else do you do during me-time? I blog a lot, which I quickly mentioned at the start but to be honest most evenings when Ellie is asleep and David is in work, I keep myself busy by scheduling posts ahead and catching up on reading other blogs.